Hewn, an artisan neighborhood bakery in Evanston, is a welcoming sight for a breadlover. On a Sunday morning, eight types of bread available including a whole wheat, seeded with flax, chia, millet, pumpkin & sunflower seeds. 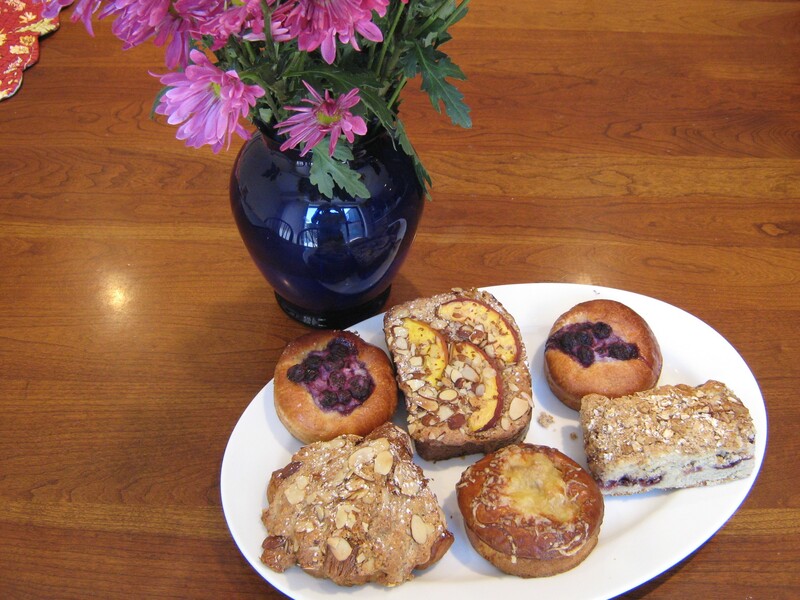 Hewn’s delicious pastries including croissants, fruit and savory brioches, slices of coffee cake & sticky buns. 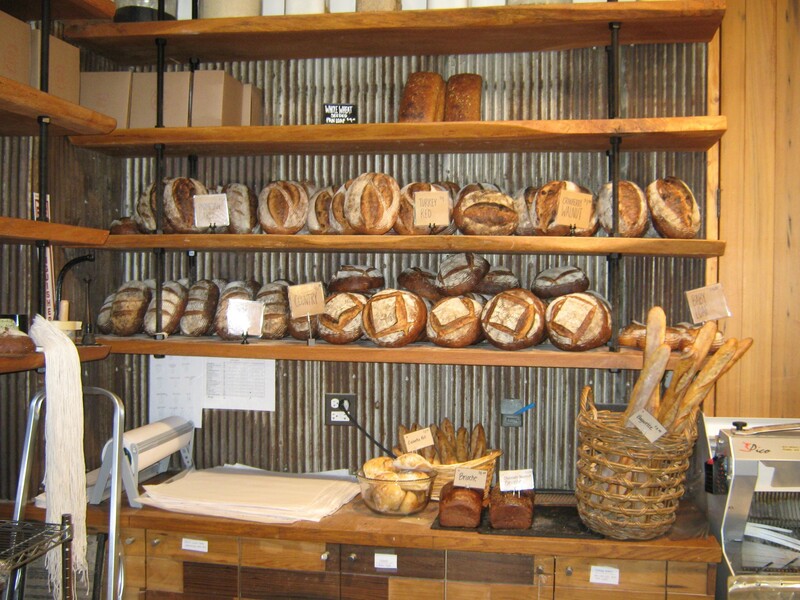 Hewn’s bread selection rotates daily. Delicious Hewn pastries, a perfect Sunday brunch treat. 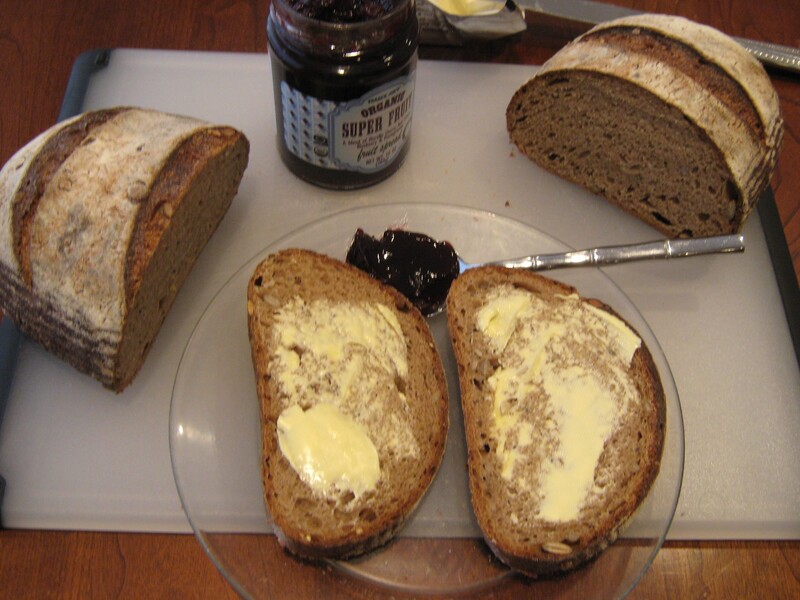 Flavorful slices of Hewn’s whole wheat seeded bead, with Kerrygold butter and organic fruit spread. 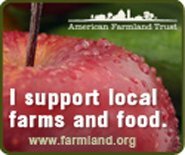 This website favors a very different approach to bread buying, if baking a fresh homemade loaf is not possible. 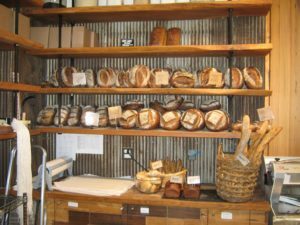 And our directory for craft bakeries, offering “naturally leavened breads and baked goods, made from scratch and hand-crafted, with the mindful sourcing of ingredients often including local grains and fruits” is one that also comes in handy on travels away from home. A recent family get-together to celebrate a favorite uncle now nearing the wise old age of ninety, in the suburbs northwest of Chicago, provided this bread lover with the opportunity to splurge on baked goods from an artisan bakery that has been admired from afar for some time. 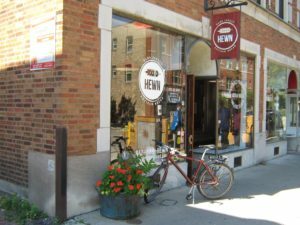 One of the praiseworthy listings included in this website’s directory of craft bakeries is for Hewn in the university town of Evanston, Illinois (home to prestigious Northwestern University). And the festive occasion for this bread lovers visit to Chicagoland warranted a sampling of Hewn’s pastries as well as a loaf of the bakery’s delicious bread. Each day, Hewn’s bakers mix its bread dough by hand, turning it over every 30 minutes over a four hour period. Then shaped, the dough is placed into bannetons (a type of basket used to provide structure for shaping loaves of bread during proofing), where it rests overnight to rise naturally. In the morning, the oven, which has a stone hearth and steam injection that helps to create a perfect crust, is fired up and the bread baked. From the start of the mix to the bake, the bread is fermented approximately 20 hours. 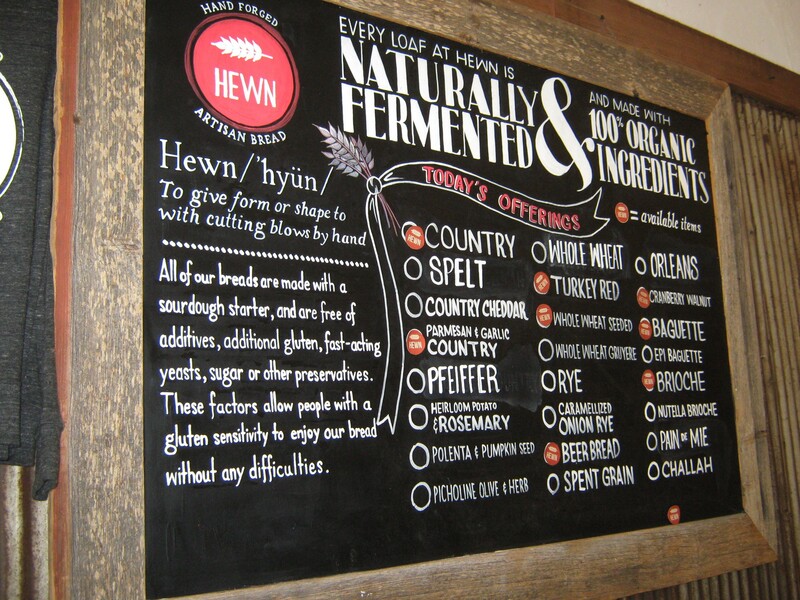 Notably, Hewn uses 100% organic flour and grains and all of its breads are free of additives, additional gluten, fast-acting yeasts, sugar or preservatives. No surprise given the care taken in sourcing ingredients and the method of baking bread (the staff of life as my father would say), that Ellen King, Hewn’s chief baker and owner, has also been a chef instructor for the “Food as Medicine” culinary classes held in Evanston with Dr. Geeta Maker-Clark. 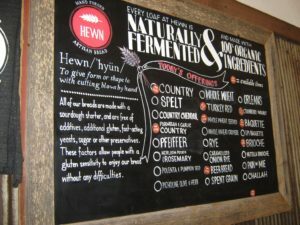 What bread to purchase at Hewn? Not an easy decision, and the choice on a Sunday morning in late July included eight different types. The possibilities were described as country, parmesan & garlic country, turkey red, whole wheat seeded, beer bread, cranberry walnut, baguette and brioche. The whole wheat seeded turned out to be an excellent choice, with its sourdough flavor complemented by a surprising variety of seeds, with flax, chia, millet, pumpkin and sunflower seeds gently folded into the dough and baked to a nice brown, crusty chewiness. A day or two later, it toasted up perfectly, and made for a delicious breakfast treat with a smear of Irish butter and organic jam (purchased at the Trader Joe’s in Evanston located around the corner from Hewn). So noticing the Trader Joe’s in Evanston, around the corner from Hewn, I knew I would be able to get butter and jam which would complement the perfect loaf of Hewn’s artisan bread. Trader Joe’s own brand of Organic Super Fruit, a “fruit spread” blend of Morello Cherry, Red Grape, Blueberry & Pomegranate as well as a half pound of Kerrygold Pure Irish Butter (with its motto prominent on the packaging, milk from grass-fed cows) are very appealing items to find in a grocery store. Kerrygold also notes proudly, next to the UPC marking on the packaging: “In Ireland, cows graze on the green pastures of small family farms. This Milk is churned to make Kerrygold Butter.” Nice. But what made me feel like a kid in a candy store was the ability to go to town and indulge in a variety of Hewn’s pastries for the family get-together. No easy decision, but a couple almond croissants, fruit and savory brioches, slices of coffee cake and an unfamiliar bostock (a sweet and crunchy breakfast pastry with roots in Normandy) made for a boxful of wonderful treats. Some limited seating is available at the front of the bakery, and from a photo on Hewn’s website also in an outdoor area out back behind the store. The bakery features Kickapoo Coffee from Viroqua, Wisconsin (which is included in our directory of fair trade & organic coffee roasters). 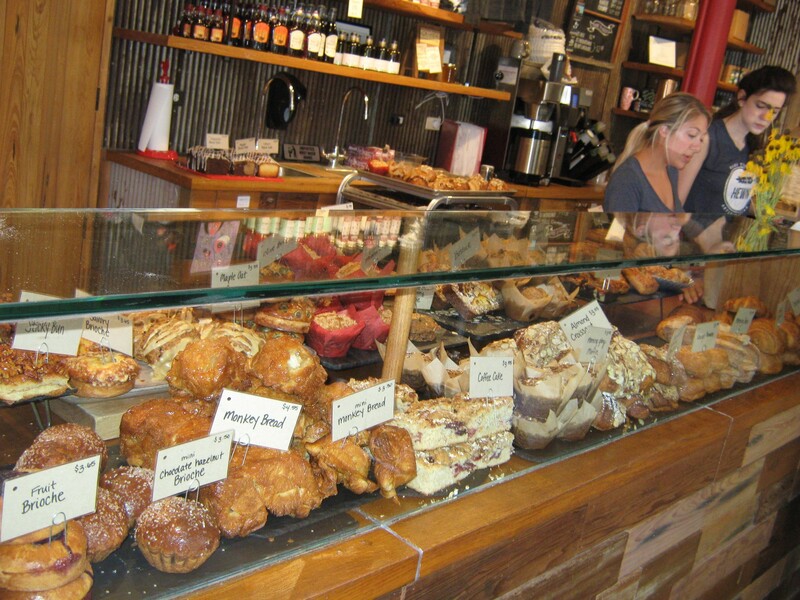 A pastry and a cup of Kickapoo Coffee could easily become a part of daily life for someone fortunate to live nearby.